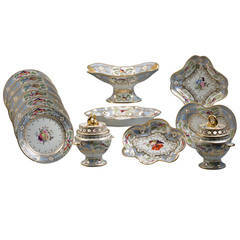 Comprising 24 plates, pair of covered sauce tureens and stands, pair of shell dishes and a pair of rectangular dishes. The bright blue ground interspersed with gilt-edged reticulation and with three rococo-formed cartouches edged in scrolls, molded flowers and acanthus leaves containing handpainted scenes of landscapes and ruins. The sauce tureens and serving pieces similarly decorated. one shell dish with minor 1.5&quot; darkened age line. 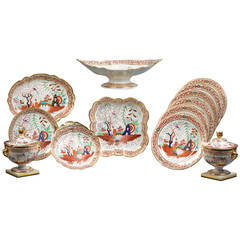 Fruit Stand, pair of covered sauce tureens, six oval dishes, pair of square dishes, pair of circular dishes, one shell dish, 24 dessert plates. Comprising 18 soups, 18 dinner plates, one large fish platter, and one large meat platter, one covered vegetable tureen, two serving bowls.